All of us experienced at some point in our lives be rejected by taxis roaming the streets of Bangkok. Although some may try to explain in their broken English as to why they can’t let you in, others would simply move away without uttering anything. I know you are pissed whenever this happens. But don’t be upset or get angry. Before thinking of running amok, let me tell you something. Everyone even those rich and famous are subject to this mistreatment. I think we are all equal in the drivers eyes. LoL. Did I say rich and famous? Yes, I did. 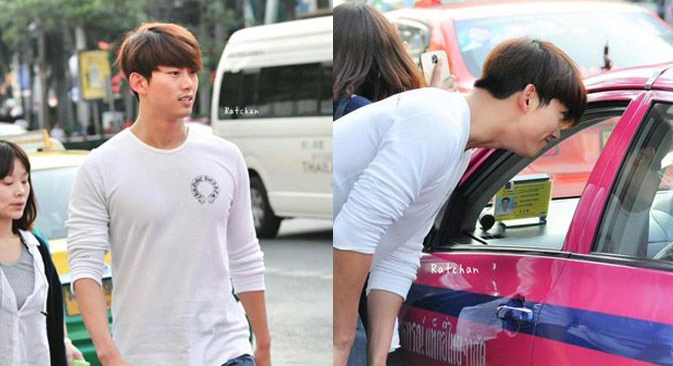 On Saturday in front of Central World, Ok Taec-yeon, lead rapper of the Korean boy band 2PM, wasn’t lucky enough. He may be used to be surrounded by excited and sometimes unruly girls, but that’s not the case with the men behind the wheel of the colorful taxis in Bangkok. Need I tell more about the “equal” thing? The Korean pop star was in Thailand for a 2PM show Friday and was shopping at Central World on a free day before heading back to Korea. If he’s a person with good memory who doesn’t forget things easily even the small ones, he might remember that some fans in Bangkok helped him in finally getting a ride after being ignored by some.